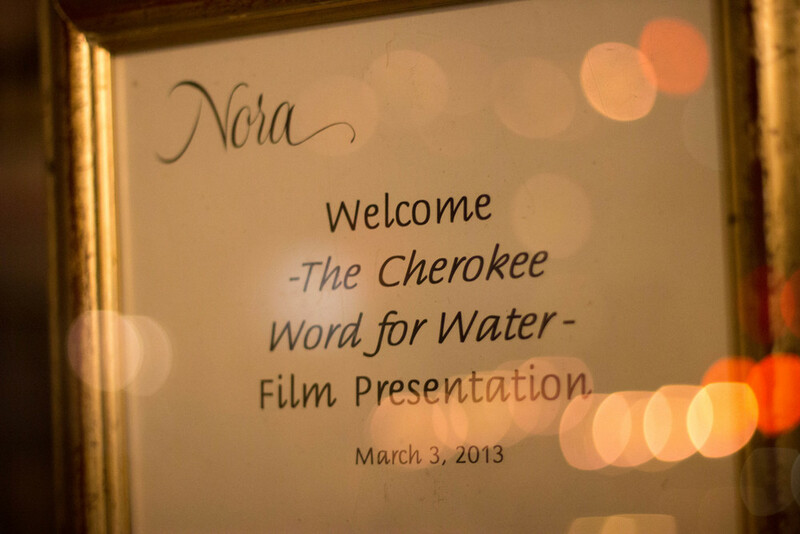 On March 3rd producers Charlie Soap and Kristina Kiehl as well as cast members Mo Brings Plenty and Kim Guerrero set of for Washington D.C. to premiere The Cherokee Word for Water. Our first screening of the trip took place at Restaurant Nora, which holds the prestigious title of America’s First Certified Organic Restaurant. We had a fantastic dinner with some very good friends and many stories were shared about our dear friend Wilma Mankiller. After dinner the movie was shown up stairs and we visited with our guests till late into the night. We then headed back to the hotel to get some sleep in preparation for the busy day that awaited us. Our first screening on March 4th took place with some good friends at CFED, which is a multi-faceted organization that works to create economic opportunity. The organization admired Wilma Mankiller and her hard work. There is even a meeting room named in her honor. The screening was very successful and was well received by the staff. From there we headed to the National Museum of the American Indian for a short preview of the movie, which was followed by a full screening later that night. 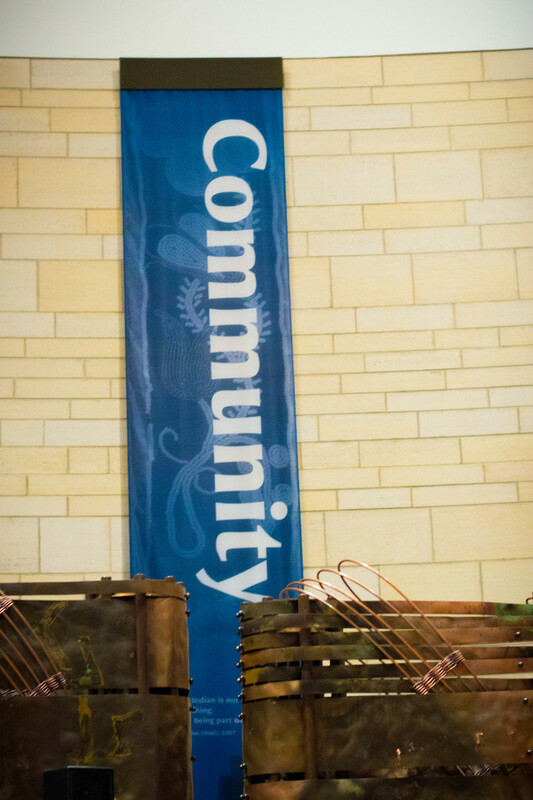 It was interesting that while the movie Cherokee Word for Water tells the story of people coming together, a banner on the wall of the museum read “community”. Our final screening took place in the North Orientation Theater located in the United States Capitol Building. Following the movie, there was a reception where we enjoyed visiting with all who attended. 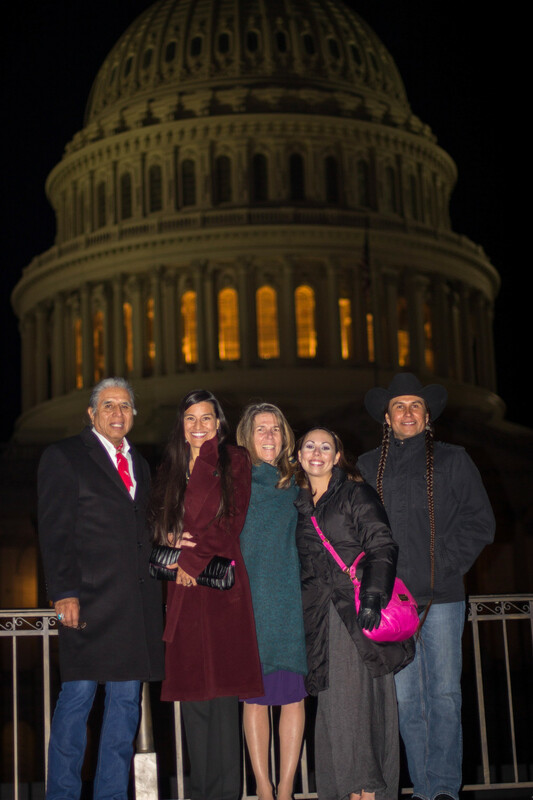 Overall it was a great trip seeing old friends, making new ones, and sharing The Cherokee Word for Water with the people of Washington D.C. We look forward to sharing our movie with the rest of the world soon! Be sure to check our Facebook, Twitter, and website for future updates about the movie. Wado.